QUICK CHARGE 3.0 FOR 4X FASTER CHARGING: Witness a whole new charging experience that’s 4x faster than conventional chargers with the latest Qualcomm Quick Charge 3.0. 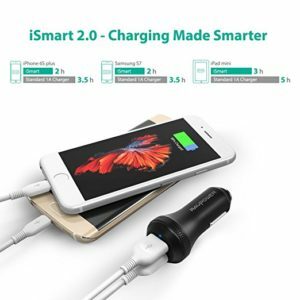 A FAST & SAFER CHARGE WITH iSMART: Benefit from smarter mobile charging with the iSmart 2.0 technology that detects all connected devices and adjusts the charging output accordingly. 36W VIA 2 USB OUTPUTS: Let the dual Quick Charge 3.0 and iSmart USB ports charge up to 2 smartphones, tablets, or QC compatible devices at full speed and simultaneously. WIDER STAINLESS STEEL CONTACTS: Experience a more stable and efficient charge even on bumpy roads thanks to the wider circuitry contacts made of stainless steel. 360° PROTECTION: Safely charge your devices thanks to the charger’s built-in protections to prevent overheating, overcharging, and short-circuit.